When you fill up a BPA-free, reusable water bottle at the tap, or one of UConn's drinking fountains or hydration stations on campus, instead of buying bottled water, you're not only saving money but also reducing your ecological footprint and helping UConn become a more sustainable campus. 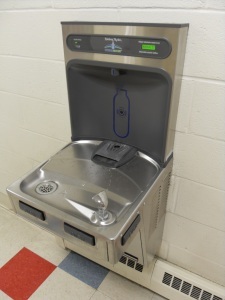 To request the installation of a hydration station, please submit a work order specifying your request. Departmental funds must be available to cover the cost of purchase and installation. Tap water is safer than bottled water. Tap water saves energy and reduces our dependence on oil, which reduces your carbon footprint. You'll save a ¼ bottle of oil every time you refill. Tap water reduces waste. UConn recycles, but even better to reduce your drinking water waste altogether with a reusable bottle. Tap water is cleaner, more efficient, more convenient, and free of charge at a location near you!